Soko G-4 Super Galeb (English: Super Seagull), also referred to as N-62, is a Yugoslav single-engine, advanced jet trainer and light ground-attack aircraft. The G-4 was designed by the Aeronautical Technical Institute at Žarkovo and manufactured by the SOKO aircraft factory in Mostar as a replacement for the Soko G-2 Galeb in service with the Yugoslav Air Force (Serbo-Croatian: Ratno vazduhoplovstvo i protivvazdušna odbrana – RV i PVO; Croatian: Ratno zrakoplovstvo i protuzračna obrana - RZ i PZO.). Production started in 1984 and lasted until the breakup of Yugoslavia in 1991. A total of 85 aircraft were built, six of which were exported to Myanmar. During the Yugoslav Wars, RV i PVO G-4s carried out ground-attack sorties, with four being lost to enemy air defences. In 1992 the remaining aircraft were relocated to Serbia and Montenegro where they entered service with the Air Force of the new FR Yugoslavia. A single G-4 was left over to the Republika Srpska Air Force. 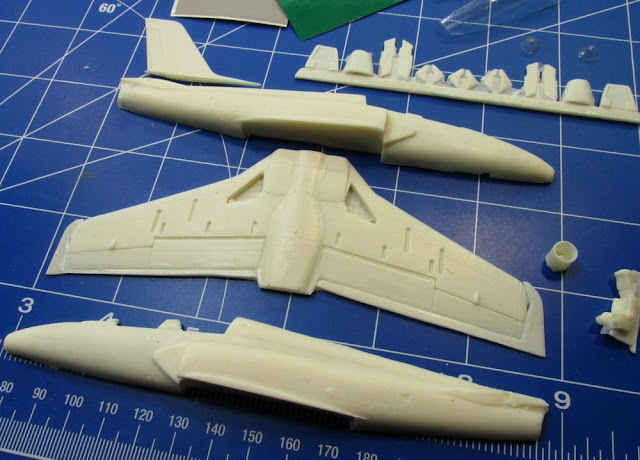 Soko G4 Super Galeb 1/72 – AEROPOXY, resin parts, decals, vacuformed canopy and landing light ,airbrushing masks & canopy frames, first test castings shots. Decals printed by LiftHere.